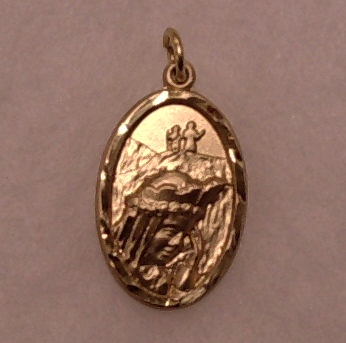 This medal is gold filed (0.75″H x 0.5″W) and comes on a card. Medal depicts the two children in the background as they notice in the ball of light the “Beautiful Lady” weeping. This is the first stage of the apparition on Sep. 19, 1846 at La Salette, France. The Lady is portrayed with the left hand over her face in the weeping pose. On the back is the La Salette invocation.